Cloak of night, brings Horseman's plight. His pricey toll, will be a soul. Run and hide before his ride. 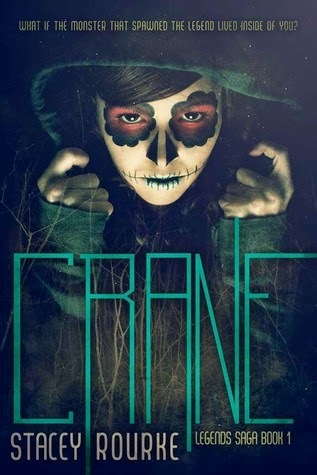 Can i just kick off this review with saying how much i LOVE the cover for Crane? It's gorgeous and perfectly fitting for the story! Hats off to the designer! Crane is an retelling of the epic legend of The Headless Horseman of Sleepy Hollow. Now i am a huge fan of the Jonny Depp film, i must have seen it fifty times. I just love the legend so when i saw that Crane was a retelling i had to read it! They had both stared death in the face this very night. It having stalked them from the shadows, revealing momentary glimpses of the meaning of true horror. Crane is told from a dual point of view but with a twist. The two main character's are Ireland Crane and Ichabod Crane. The two storys run parallel to each other, in Ireland's story she has just moved to sleepy hollow but after her arrival people are being beheaded and a new breath of life is breathed into the legend of the Hessian that the current day population thought was nothing more than a legend. In Ichabod's story he too has just moved to the town of Sleepy Hollow with his two brothers in arms Irving and Rip Van Winkle, the town live in hear of the Horseman with a curfew in place for the towns people they think they have a bargain with the Horseman until people's heads start being removed from their bodies. I really liked Ireland, she was incredibly witty and down to earth, honestly she has some of the best one liners ever! After a bad break up with the douche bag of an ex Brantley she moves to Sleepy Hollow in search for a new start, sworn off men and dating she get a new job as a guidance counselor at the local high school. Not long into her new life people are being beheaded and Ireland discovers a sleeping Rip in her cellar preserved by a spell so he could one day help the next Crane who came to town in breaking the curse that has befallen Ichabod Crane and his endless thirst for blood. So Ireland and Rip start to work on the curse of the Hessian and it soon becomes all too clear that Ireland is a lot more involved than she believed. With the Hessian wreaking havoc and Ireland living in fear of the curse time is swifly running out she and Rip need to find a way to control the Hessian before anymore people are killed. Small silver hooks had been fished through his upper and lower lids, forcing them open. Blood pooled in the corners of his eyes, trickling down his face in crimson slashes. Ichabod's story is based shortly after the Revolutionary War and is the telling of how he became the Hessian and all the events leading up to the dreaded moment when he'll loose his head but gain the curse. The Horseman is already feared in the town of Sleepy Hollow, the towns people believe that they are in a reprieve from his reign of mayhem and terror but soon after the arrival of the three friends he takes his first victims kicking of a trail of events leading to Ichabod's doom. Even though she's sworn off men Ireland cant help wanting to spend time and get closer to her neighbor Noah, the two have a steady very slow building romance that is very sparse through out the story but it was brilliantly played. Noah is hot, muscled, blonde haired with hazel eyes he is totally swoon worthy but with Ireland swearing off men and an unexpected visit from her ex all between trying to figure out the curse their romance doesn't really kick off until the end of the story. Ichabod and Katrina's romance is another story, it was love at first sigh for Ichabod, he fell hard and fast for Katrina but knew that she could never be his due to her being daughter to one of the richest men in Sleepy Hollow and him being nothing but the towns schoolmaster. This however didn't stop the two from seeking time together, honestly it was bittersweet knowing where their story was leading but it really was the sweetest romance in the middle of such horrifying events. "So, is this the part where the noble citizen challenges the monster that ravaged the hapless town?" It took me a while to get into this story but i think that's just because i was in a bit of a slump and no fault of the book it's self, the best thing was probably the mystery and the characters. I mean all of them from Ichabod and Katrina to Ireland, Rip and Noah they were all instantly likable and this book held a lot of humor as well as terror. There really were some gruesome moments that created some pretty vile images in my mind but only helped make the book better! "Now could you please focus on the road, or should i brace myself for further infantile tantrums?" Blatant disrespect! Cut off his tongue and feed it to him! Both Ichabod and Ireland were very different characters, but both were incredibly likable, Ichabod in his gentle heart and Ireland with her wit and quirkiness. You can't help feeling for the pain and all the trouble and anguish they went though. Seeing Ichabod's story though his eyes really was an incredible bonus to the story and fabulous insight to the man he was before the curse. Crane is an extremely enjoyable read, from the mystery of the legend to the humor. There were a lot of moments where i was laughing out loud at what the characters said or did and it definitely had the creep factor!! Entertaing and moreish this was an epic retelling of the legend and got better and better as the story went on, by thee time the book was ending i was loving it so much i dreaded hitting the last page. Oh and the times Ireland spoke to the Hessian had me in hysterics! I cannot wait to get my hands on Raven!! "How will the world remember Ichabod Crane?"